Pointer treats are produced from only the best ingredients, considerable care is taken to ensure that your Dog will enjoy this delicious treat. They are ideally fed as a treat, or a reward during training. Fresh drinking water should always be available. This product is a supplementary feed only. Pointer Treats are prepared under expert nutritional supervision, so your dog is assured of a well balanced treat. Cereals, derivatives of vegetable origin, meat and animal derivatives, vegetable protein extracts, algae, oils, fats and minerals. 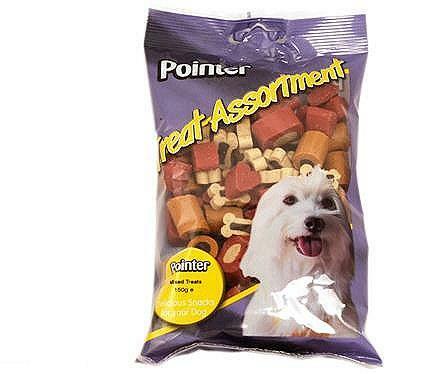 There are currently no questions for Pointer Treat Assortment for Dogs - be the first to ask one!